A work trip to Munich, and another opportunity to go looking for a proper cup of tea. Now, I know that there are one or two perfectly decent tea houses in Munich, such as Victoria House and the Friesische Teestube, but I wondered how the 5 star hotels would manage to serve a fussy lady her national drink. 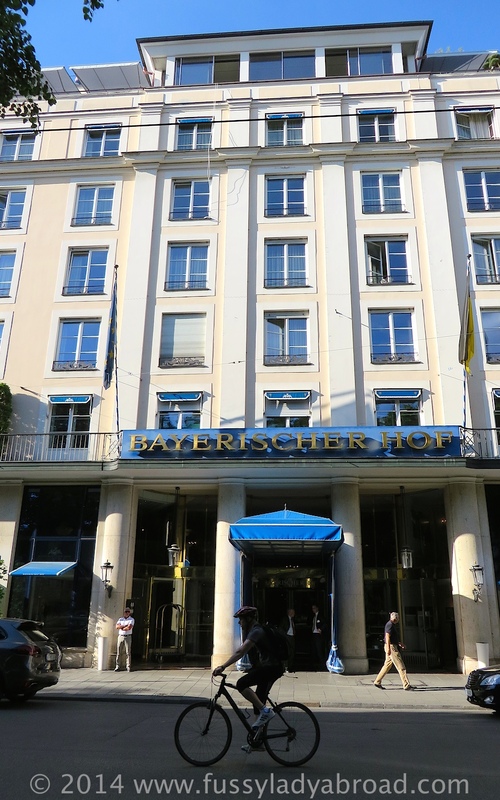 I asked the locals at the work meeting where I should take my tea, and they said that the Bayerischer Hof had been named the best hotel in Germany by the industry website hotelier.de and according to Focus it is the second most expensive hotel in Germany. And so, a plan was made with my friend PenelopePunctual. She’s British too, but in a “Norn Iron” kind of way. After an hour of waiting, and with no sign of PenelopePunctual, I headed alone to the Bayerischer Hof. 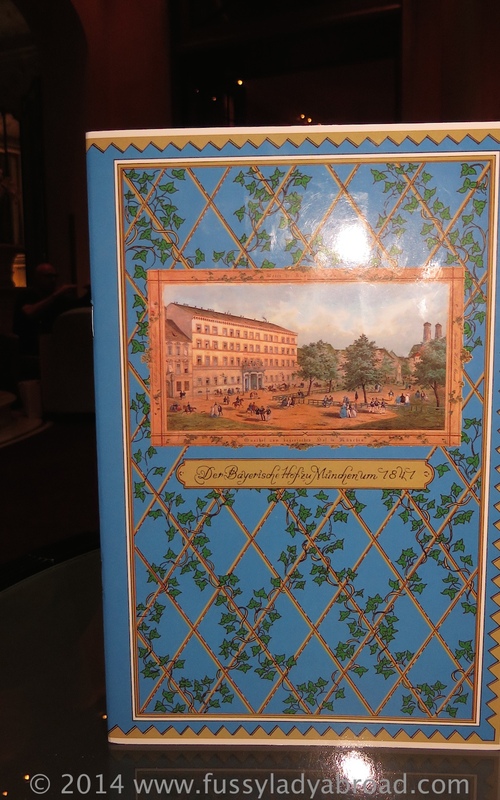 Back in the day, the Bayerischer Hof and the Vier Jahreszeiten vied for top place in the Munich luxury hotel rankings. In the meantime, there’s a bit more competition. The lobby lounge was quiet when I arrived. Any 5 star hotel in London will be buzzing at this hour with people enjoying afternoon tea. Today, the buzz in Munich is in the beer gardens. There is a small selection of tea and I ordered the Spring Darjeeling. I waved away the cream, lemon juice and bewildering selection of sweetening products. The waitress told me to let the tea infuse for two to three minutes. I remember now, that at home, we used to let our tea draw. German tea pulls. Anyway, I was glad there was a little glass bowl to hold the high end tea bag when the time came for the bag to be removed. Munich water is notoriously hard and tea becomes bitter very quickly if you do not remove the leaves, high end tea bag, or dust filled paper on a string. No cake was ordered as there was no-one there to eat it. I assumed that PenelopePunctual would find me there once she picked up the message I left, but her cake eating opportunity had definitely passed. As you can see the crockery is nothing fancy and the teapot has a crack. Oh dear. The tea tasted fine, nonetheless. The staff, who were quite young and probably trainees, were lovely. They spoke with a noticable Bavarian accent. I noted a slight lack of confidence. Am I that scary? 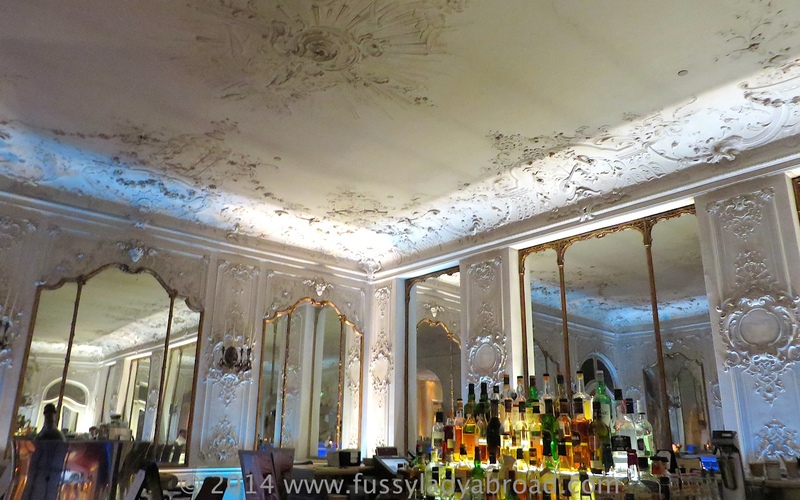 The Bayerischer Hof has a range of restaurants and bars to choose from. Of course, only some of them are suitable for a fussy cup of tea, but I did a brief tour, just to be sure. There is a fabulous terrace on the roof linked to their Spa restaurant. When PenelopePunctual arrived, we zoomed up there to see if we might take dinner overlooking the Munich skyline. The sight of groups of business men and people in bathrobes had us back in that lift without so much as a decent gin and tonic to watch the sunset by. The lobby lounge is sleek and comfortable and leads to the stunning bar.The bar miraculously survived bombing in WWII which destroyed the rest of the hotel. The chandelier scan told me that we were far from Vienna and Lobmeyr. The entrance offers a rather mean looking effort which is decorated with real candles, their realness evidenced by the erratic alignment. 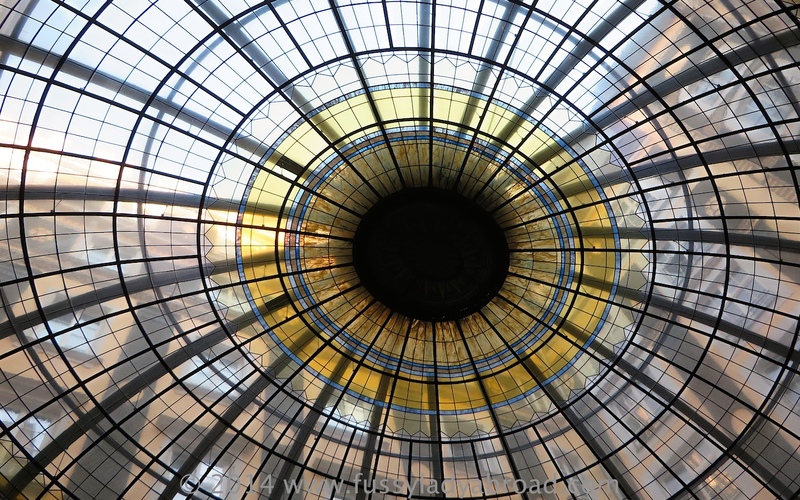 The glass dome over the lobby lounge is a small compensation and provides a nice sense of light and space. And the Falk’s bar is like a huge mirrored blue lit wedding cake with gin on tap.I shall return here for a drink one day to give that bar its own review. When I arrived, there was some conference of German business men crowding the lobby and just a few hotel guests in the lobby lounge. As time went on, some local ladies arrived. They were quite obviously from Munich, not because they were wearing dirndls, but because they were dressed in the kind of overly decorated blazers and jackets that they probably bought from Escada in its Munich heyday. There was a time when half the women in Munich gadded about in jackets with gold embroidery and outfits that declared their designer provenance by the use of bright colours. So, I would often see people at work in the classic shift dress and blazer combination that we British ladies buy in M&S, but the dress would be pink and the blazer would be lilac with gold embroidery. 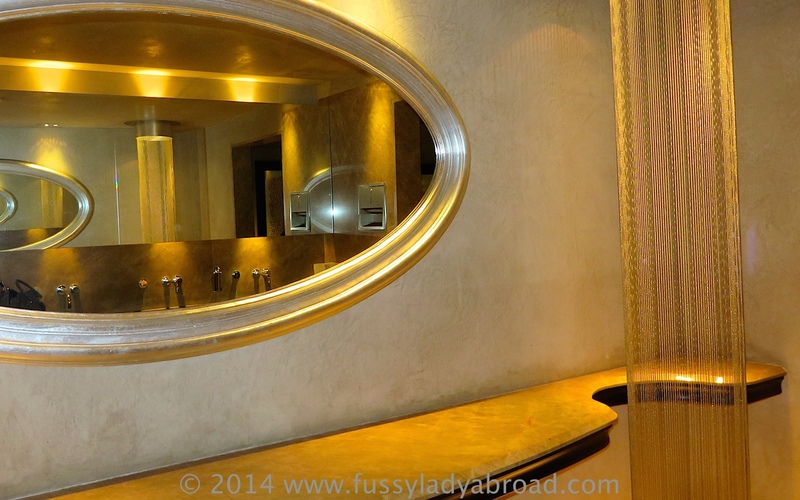 Those ladies who were meeting at the Bayerischer Hof that evening had kept those outfits. The hotel guests were either European business types, or global travellers in t-shirts and baseball caps. The facilities are one floor below and shared with the hotel’s night club and one of the restaurants. There is suede on the walls. The lighting is such that the ladies from the lobby will not see the passing of the decades on their faces. This thoughtful decision by the designer means that the lighting is such that the cleaning staff probably cannot see properly to clean. So, although basic cleanliness is fine, the added sparkle of glorious 5 star uncompromising cleanliness is missing. The recycled paper hand towels are a disappointment. The soap has no name and there is no hand lotion. CraftyLinguist and MadFrenchLady were not with me, but they had somehow taken up residence in my head. When I saw the menu, and the offer of Rhubarb Triffle, I could hear CraftyLinguist’s completely reasonable, oft-repeated speech about how shocking it is that 5 star establishments take so much care with everything else, yet somehow find it OK to let schoolchildren and internet machines translate menus. For their sakes, I checked out the cake selection. The Rhubarb “Triffle” in a whisky glass looked more like stewed rhubarb with custard and cream on top. The other cakes seemed to have been made on the premises, but the Käsesahnetorte, which is a light fluffy whipped cheesecake with a sponge base, was curling at the edges. The Apfelkuchen looked good, as long as you like cinnamon. One thing that annoys me about the Germanic cakes is that they never seem to use apples without adding cinnamon. Now, I like cinnamon and I like apples. But I prefer my apples without cinnamon. Every time I eat Apfelstrudel or Apfelkuchen, I find myself thinking just how delicious it would be without cinnamon. I am reminded of an afternoon tea at Gleneagles some 25 years ago, when the Swiss pastry chef of the time added cinnamon to the scones. A sad day for scones. PenelopePunctual was, in fact, on time that day, but she was not quite “on message.” The law of “this sort of thing” had us waiting for eachother at different ends of the same bus stop: me assuming she had been delayed at work; and she “off message”with her phone left on her desk. 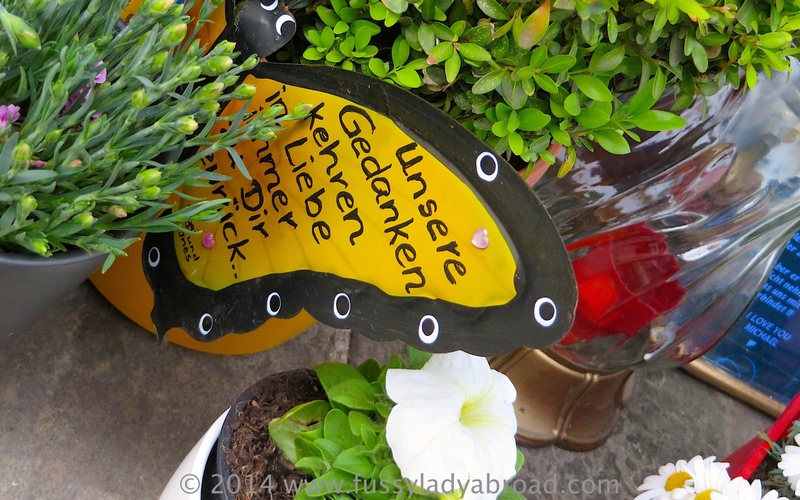 Outside the Bayerischer Hof there is a monument to Orlando di Lasso which has been colonised by Michael Jackson fans. Hotel staff told us that Michael Jackson stayed at the hotel many times and therefore his fans have set up and maintain this memorial to him PenelopePunctual and I inspected the tributes in some detail and jointly despaired for the bereaved fans, and for society as a whole. 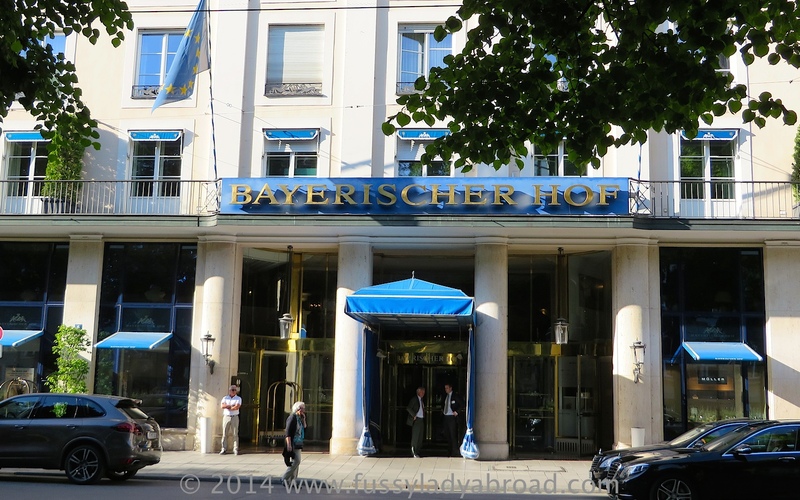 The Bayerischer Hof is a first class hotel and offers a range of bars and restaurants for all tastes. So, you will be comfortable there. However, considering the teabags and the cracked pot, if it is a proper cup of tea you are after, go elsewhere. Bayerischer Hof, for a proper cup of tea, earns 2 teapots out of a possible 5. Enter your email address to follow this blog and get Fussy updates by email.